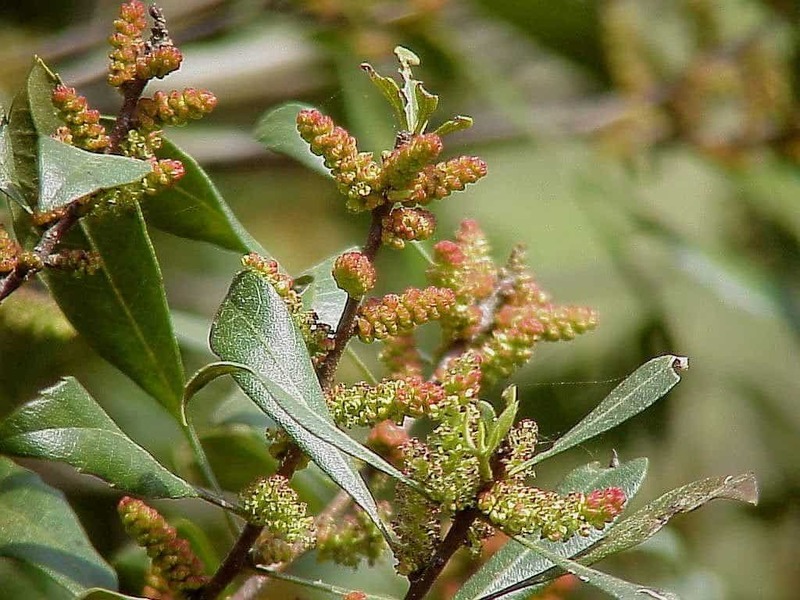 Wax myrtle is an aromatic evergreen shrub, in the Myricaceae or bayberry family. 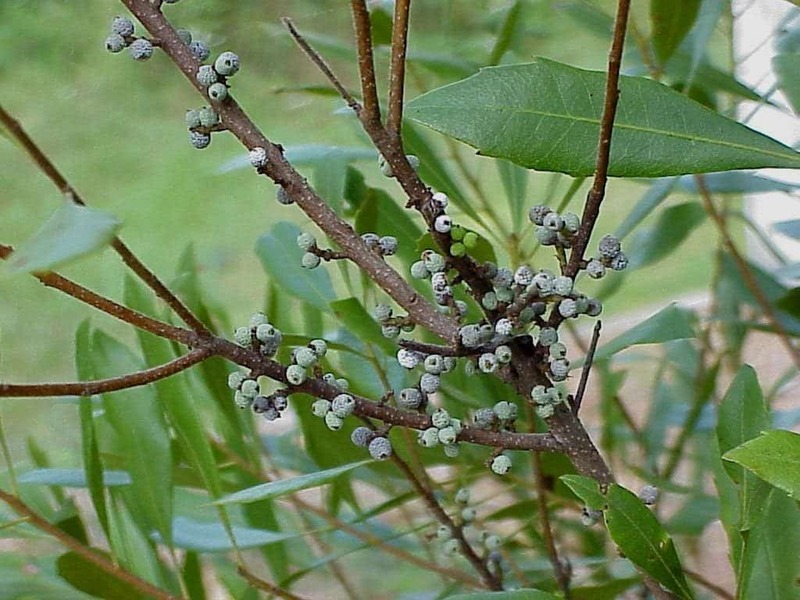 Wax myrtle (Morella cerifera) can reach 25 feet in height at maturity. It commonly produces multiple trunks and sends out runners that produce new plants. It is clonal forming and produces thickets. The national champion is in Bradenton, Florida and has a 3 foot trunk circumference, is 28 feet in height and has a 33 foot spread. 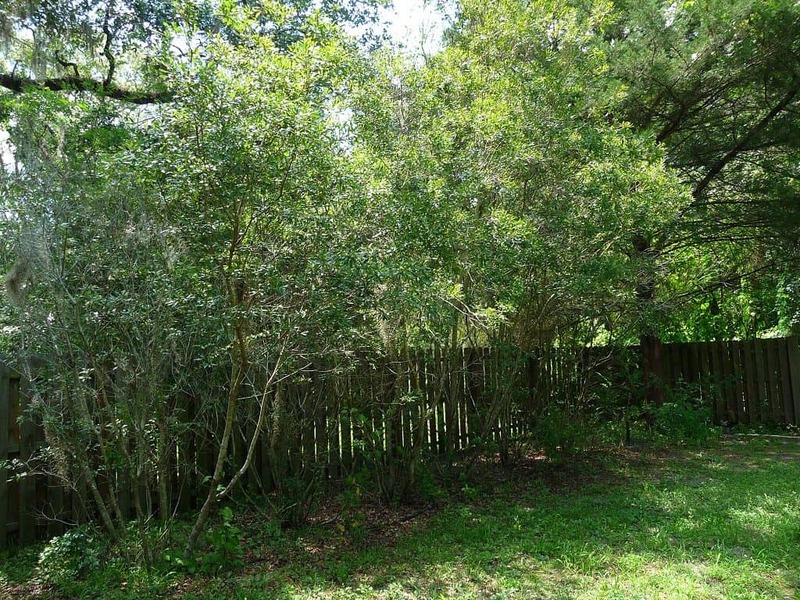 Wax myrtle can be found growing in a wide variety of habitats throughout Florida including coastal areas, pine savannahs, cypress swamps, wet hammocks, bogs, upland hammocks, old fields, and fence rows. Its flowers are in the form of catkins that are born in the leaf axils. The catkins are approximately 3/4 inch long and appear in early spring. Male and female flowers are found on separate plants (dioecious). The flowers appear in great profusion and attract many insects which in turn attract many birds, especially winter warblers. 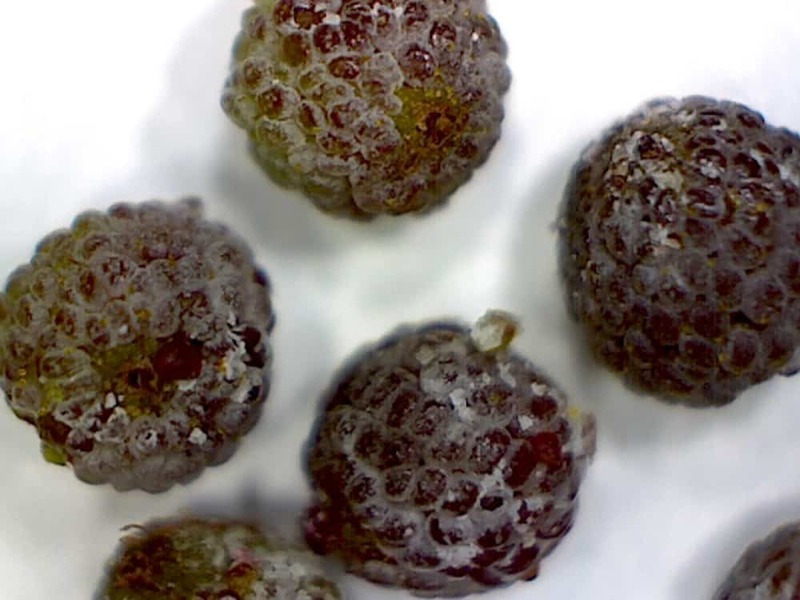 The fruit is a small, round, waxy berry (actually a drupe) that is approximately 1/8 of an inch in size. The berries are eaten by a wide variety of birds. Early colonists used the berries to make scented candles. The berries were boiled in water and the wax skimmed from the surface. Another common name that may be familiar is bayberry. Its ability to thrive in an array of habitats makes it an excellent landscape plant. It will tolerate wet to dry soils and salt spray. Depending upon how it is pruned it can be either a hedge plant or specimen. The trunks can be pruned of lower branches creating a multi trunked tree, or you can pruned it back each year to produce more abundant lower foliage for a dense hedge. When grown in too much shade it can get very leggy and leaning..
Propagation is achieved through cuttings or seeds. Soaking the seeds in hot water or rubbing them on a rough surface helps to scarify the seed and remove the waxy coating. Stratification, or exposure to cold temperatures, is not required. Cuttings should be taken from semi-hardwood in the early summer. Rooting hormone can be used, but the time of year for collecting the cuttings seems to be most important. Root cuttings or removal of runners can be done throughout the year. Keep an eye out for seedlings coming up in your yard compliments of the fruit eating birds. 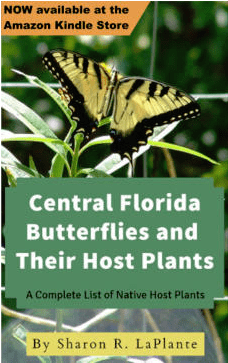 There are two other species in Florida, Myrica inodora, which is found in the panhandle, and M. heterophylla, which is found in the northern half of the state. A dwarf form is often seen at landscape nurseries, but there is some controversy as to whether or not the dwarf wax myrtle, M. cerifera var. pumila, is truly a distinct and separate species.